(without stand or speakers) 28.6" x 17.1" x 2.0"
The all-new M-Series 32” (31.50 diag.) 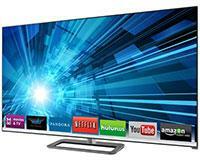 Razor LED™ Smart TV has arrived with an ultra-modern design and brilliant Razor LED™ picture quality. And the new, faster VIZIO Internet Apps Plus® Smart TV experience gets you connected with built-in Wi-Fi to the latest hit movies, TV shows, music and more. VIZIO M-Series: It’s the must-have entertainment upgrade you’ve been waiting for.